At the 2013 Annual General Meeting of the FQPM, President Bob Burns made a presentation of a QP150 Limited Edition Commemorative Sword to the Curator of the Queensland Police Museum. 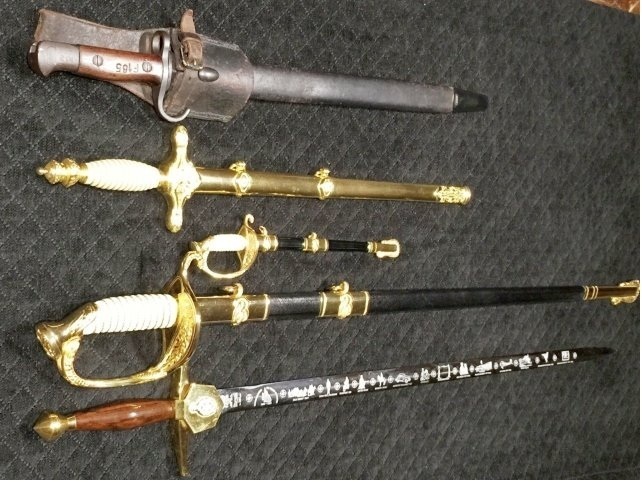 The sword now completes a series of Queensland Police Service commemorative swords that have been released since 1982. 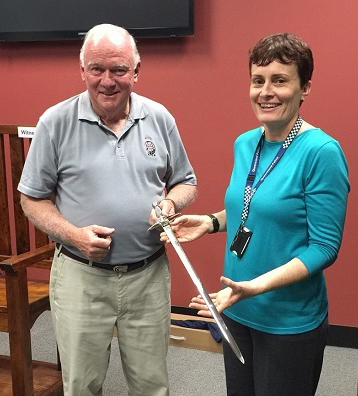 On 10 June 2015 the FQPM President Bob Burns presented QPM Curator Lisa Jones with a Queensland Police commemorative sword that had been acquired for the museum. 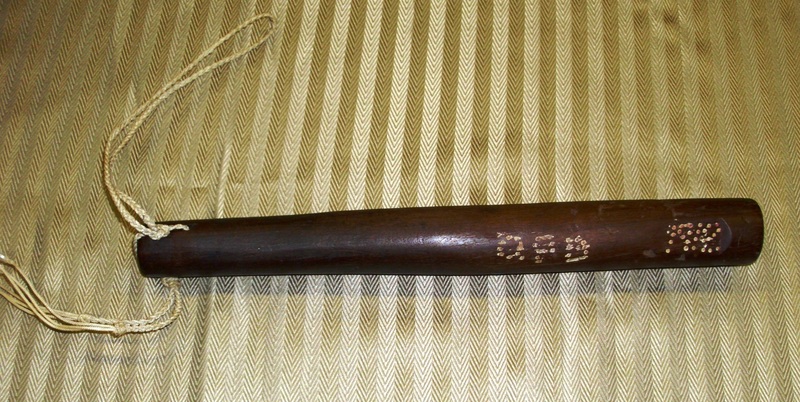 This historical baton was used by a Special Constable during the 1912 General Strike in Brisbane. It is not a turned piece of timber, but a shaped piece of tree branch. 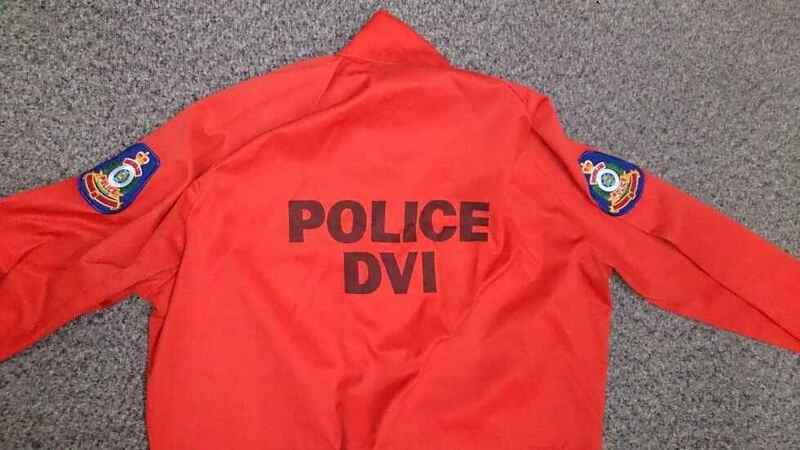 A welcome addition to the QPM’s uniform collection is an orange pair of DVIS (Disaster Victim Identification Squad) overalls in good condition. The shoulder patches date the overalls to about 1981. 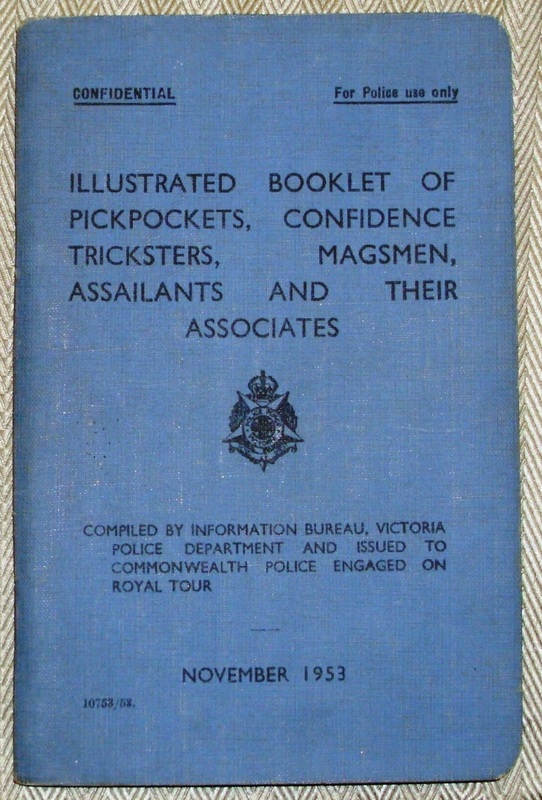 A booklet produced by the Victoria Police for the Royal Visit in 1954 for reference by police attached to the tour. 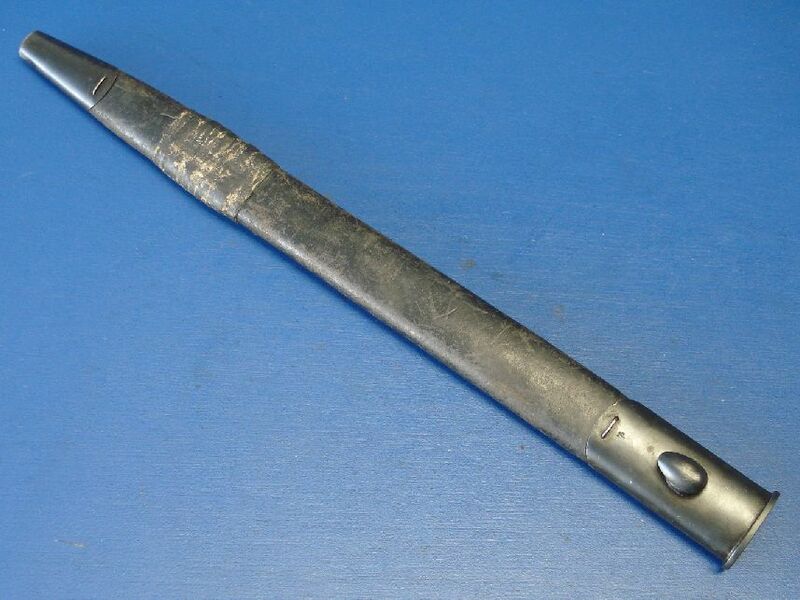 During 2011/12 a 1907 .303 Lee Enfield bayonet scabbard which was marked Q↑P and the serial number 564 was acquired for the QPM. 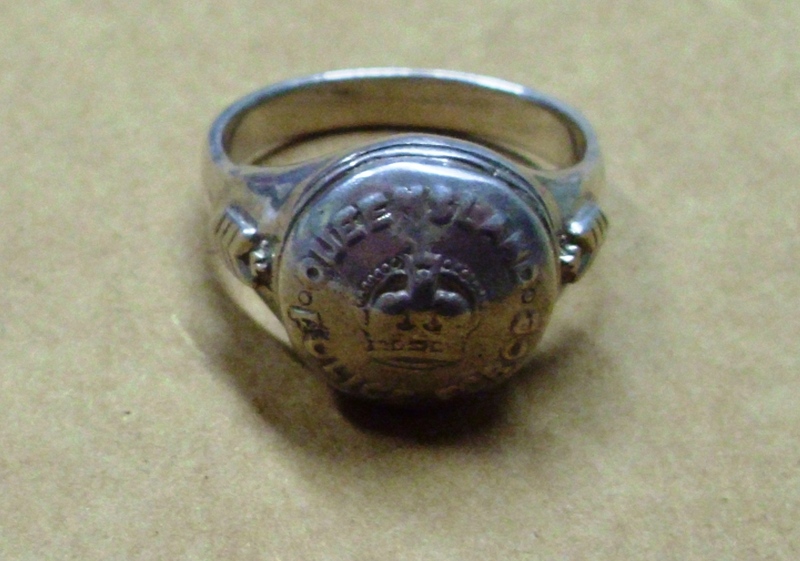 During 2011/12 a silver ring mounted with a Queensland Police insignia was acquired for the QPM. During 2011/12 an historic envelope addressed to the Commissioner of Police was acquired for the QPM. 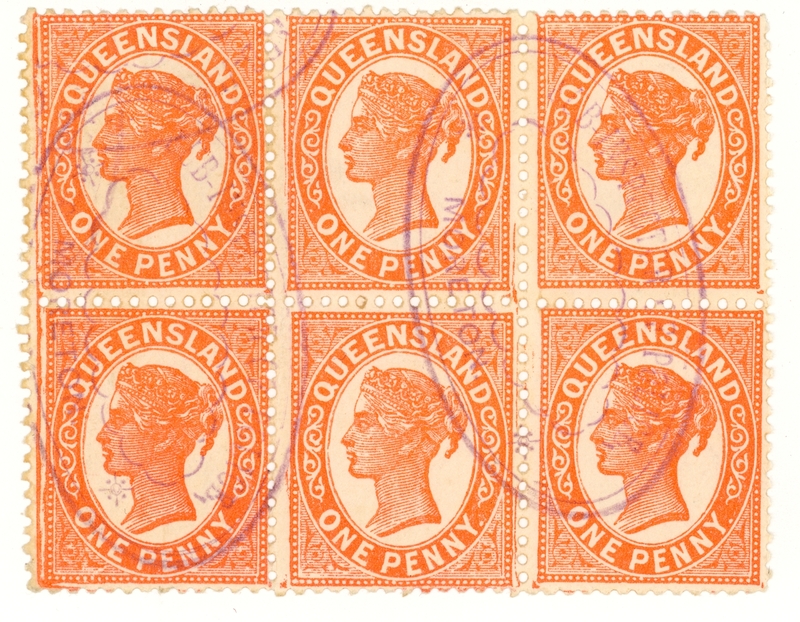 The envelope was dated 1900 and had 1d and 3d stamps affixed to it. 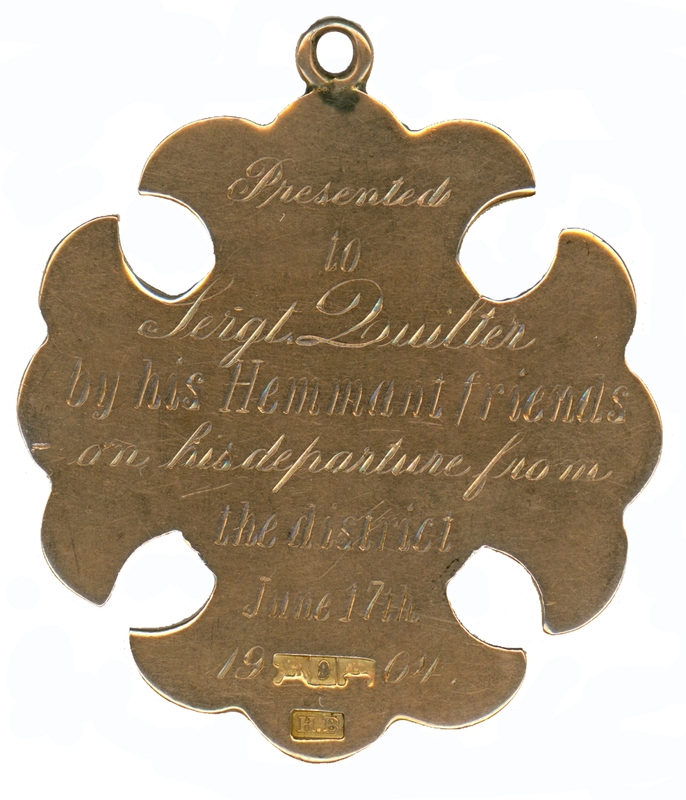 Rose gold medal/pendant inscribed with the words ‘Presented to Sergeant Quilter by his Hemmant Friends on his transfer from the district in June 17 1904’. The medal was purchased by the FQPM from an antique dealer for $500 in April 2008 and subsequently donated to the Queensland Police Museum. Sergeant Quilter was sworn in on 20 August 1886 and retired on 19 April 1920. He was highly regarded by the communities in which he lived and worked. He was a police officer for thirty-three years retiring at the rank of Senior Sergeant and was awarded the Imperial Service Medal (ISM). During his career, he was transferred to twelve stations. In 2007, Bob Atkinson AO APM, the then Queensland Police Commissioner purchased a 1935 Hercules Bicycle. The cycle was subsequently restored by Mario Pezzimenti who spent hundreds of hours working on it. 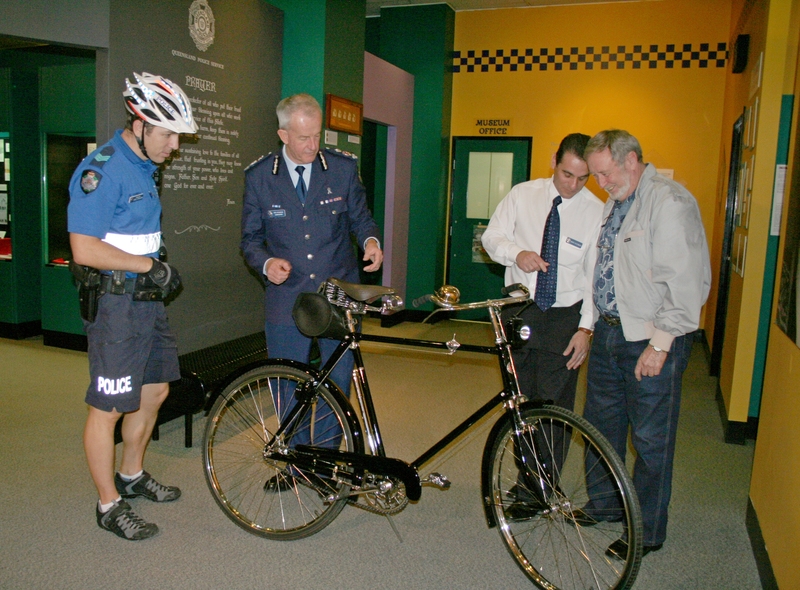 In 2008 the FQPM accepted the bicycle from the Commissioner on behalf of the Queensland Police Museum. The bicycle is now on permanent display in the museum’s transport display. The history of the opening up of Australia’s north-eastern districts in the mid-nineteenth century is littered with the bodies of both settler and Aborigine. It was an inevitable conflict and one which threatened to become open warfare. The Native Police force – consisting of European officers and Aboriginal troopers – was established to keep the peace in those wild frontier days. What developed, however, was a force largely devoted to the protection of the adventurous squatters, their families, and employees. 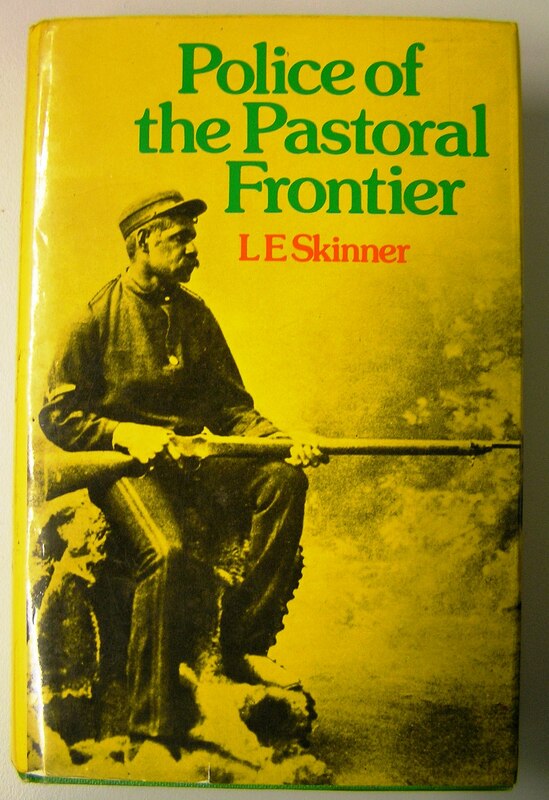 Police of the Pastoral Frontier by L.E. Skinner (1975) for the first time tells the complete factual story of this unique phase of colonial history, as far as this is possible from official and unofficial records, eye-witness reports, and newspaper commentary. It is a story of misunderstanding, bungling, and violent reprisals and it reveals clearly both the humanity and inhumanity of administrators, police, settlers, and Aborigines. Arms in the Service of Queensland 1859 – 1901 by J.S. Robinson (1997) purchased by FQPM member Richard Batty for the QPM collection. It gives the QPM access to an area of historical research on which none of the museum staff have much knowledge. 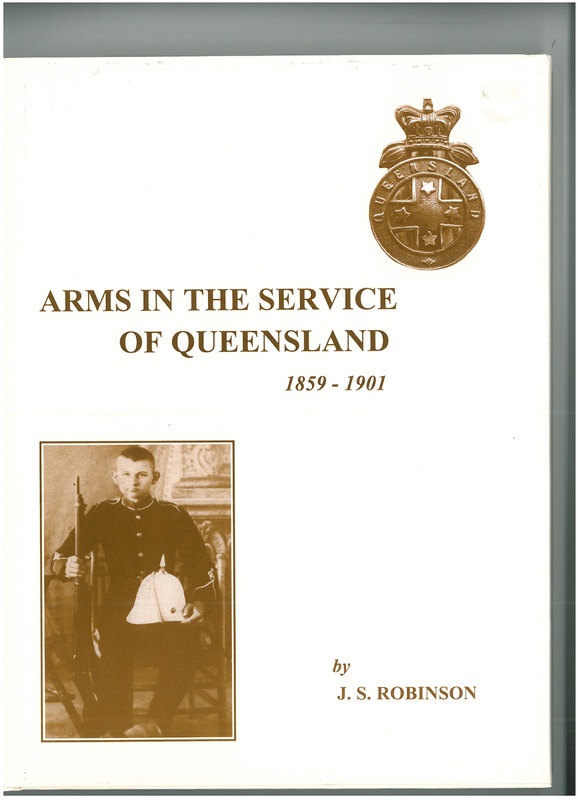 The book is described as a look at the service arms, ordnance, fortifications and navy of the colonial Queensland government. The new Colony was proclaimed on 10 December 1859, separate from New South Wales. No other single work has attempted to cover such a broad spectrum of this colonial defence, through Russian and French invasion scares, tempered by the rebellious confrontation of the Shearers Strike of 1891, which essentially saw the birth of the union movement in the Antipodes and the Australian Labor Party. Rather than produce this study in customary chronological chapters, J.S. Robinson has taken the four different fields of small arms, ordnance, fortifications and naval power and followed each through its own particular development but maintained the chronological and personality links which present the whole work as a cohesive and detailed, yet very readable record of this interesting period in colonial Australian and British history. With virtually exclusive application of primary sources of the day, the author paints an authentic picture of the times and trials of a fledgling colonial government in the latter part of the 19th century. Record of the accidental deaths of gunners Walsh and Wilkie firing a salute for the opening of Parliament, the enigmatic Captain Wright dismissed for disloyalty and the defence forces in the Shearers Strike are but part of the interesting reading.